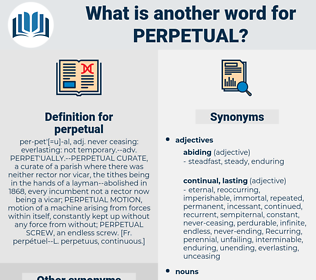 What is another word for perpetual? eternal, everlasting, continual, constant, continuous, never-ending, permanent. endless, persistent, timeless, incessant, steady, ever-present, enduring, relentless, long-term, unending, unrelenting, continued, ceaseless, abiding, sustained, nonvolatile. completed, ephemeral, Ceasing, ending, intermittent, interrupted, stopping, changeable, momentary, discontinuous, finite, fleeting, halting, irregular, finished, terminable, limited, bounded, temporary, transient, brief, changing. unsteady, alternate, out-of-date, noncontinuous, dated, outworn, passe, outmoded, alternating, outdated, seasonal, serial, occasional, spasmodic, archaic, rhythmic, antiquated, fitful, mortal, spotty, obsolete, sporadic, cyclic, erratic. If anyone call save him, Dortoman will, ' was his perpetual cry.